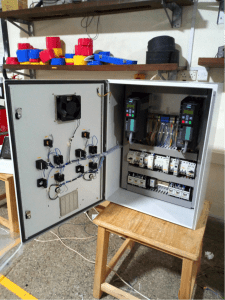 IET designs and manufactures high quality switchboards and control panels for use in a wide range of electrical installations. Our team of highly skilled engineers and technicians are guided by ingenuity and integrity from conceptualization of the client’s needs through the design process to production of the final equipment. Our world-class assemblies are periodically taken through thorough tests by international certification bodies and the Kenya Bureau of Standards (KEBS), a process that has won trust in the East African market as regards impeccable quality and durability. The safety of your electrical system and personnel. Reliability and durability of our solution to guarantee your system’s efficiency and stability. Optimization of designs to cut on costs but maintaining a high quality. Low Voltage Switchboards and Distribution panels. 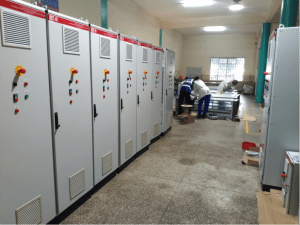 Automatic Power Factor Correction Panels. Motor Control Centre panels of various types including: Soft Starter Panels, VSD Panels, traditional contactor-type motor starters, Intelligent PLC-Controlled MCCs. Auto-Mains Failure (AMF) Panels of different types including: Circuit breaker-type auto-manual changeovers, Contactor-type auto-manual changeovers; Auto-manual changeover switches. Water treatment plant control panels.